Tannerite® binary rifle targets, when mixed and used correctly per instructions, will not cause a fire. 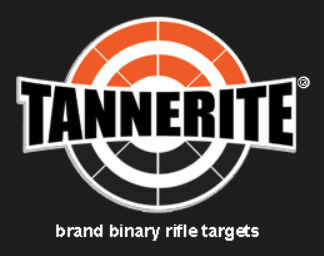 The original Tannerite®brand binary exploding target was specifically designed from conception to be non-incendiary. This means the product was created using materials of the highest quality and properly formulated to ensure that it will not cause a fire. When a bullet hits Tannerite® with a high velocity (2000 ft./sec. minimum) it causes a chemical reaction which results in a large water vapor cloud along with a loud report which is used as a shot indicator. Please note, however, that there are many knock-off products that can start fires due to an improper formulation and low quality raw materials. Even though Tannerite® brand targets will not start fires, all brands of exploding targets are banned during special fire orders. Please obey these restrictions. Alabama sales tax is charged on applicable sales. All items are subject to availability and must be paid in full when placing orders. Great starter kit containing 6 half pound exploding targets. Comes with everything a regular case comes with including a dvd, mixing container, spoon and written instructions! Great for gifts and first timers wanting to get their feet wet! The best deal for the 1st time buyer. This is our original target kit. 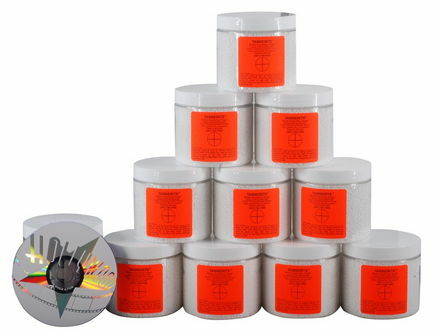 Tannerite® is non-hazardous and can be shipped without expensive hazmat fees. The catalyst mixes easily into each 1/2 pound target. A free instructional dvd is provided with every order which shows the legalities and requirements regarding the possession and use of this awesome product. The Tannerite Exploding Rifle Target ProPak 10 1 lb. Target Kit is one of the most fun targets you can buy when used as directed. 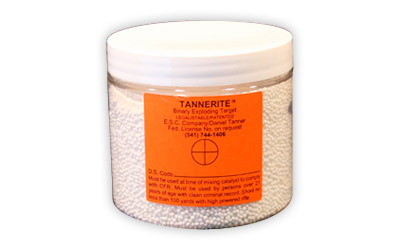 Tannerite is a binary explosive used primarily to make targets for firearms practice. 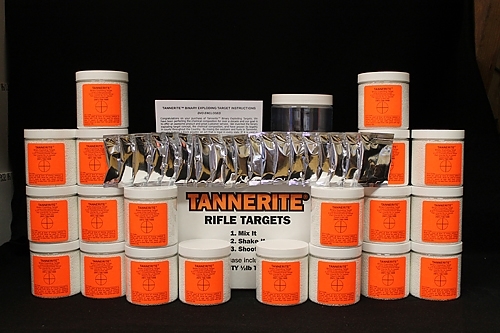 Tannerite is unique because it is exceptionally stable when subjected to less severe forces such as a hammer blow, being dropped, or shot with a rimfire. The targets are supplied as two powders, that when carefully combined as indicated in the instructions, produce an explosive target. The two individual components are completely safe and stable by themselves, and will not explode until mixed together. Tannerite detonations only occur when the target is hit with a bullet at high velocity, producing a large explosion and cloud of water vapor. This is useful for long range shooting practice, as you get immediate feedback when a target is hit. Carefully read all instructions before using Tannerite Targets! Warning: Misuse of this product can result in serious bodily injury, destruction of property, and/or loss of life or limb. Keep away from children. Use eye and ear protection and follow all firearm safety standards. Use only in clear areas free from all flammable material and debris that could become projectiles. Use at a minimum distance of 100 meters. By mixing this product, you state that you understand and will follow these directions, and release the producer and/or distributor of this product from any liability from the use or misuse of this product. Misuse of this product is a violation of federal law. This product must not be mixed away from the location of use and should be detonated soon after mixing. Do not transport mixed product. Do not resell mixed product. Do not store mixed product. Comply with all local, state, and federal rules and regulations regarding use of and/or disposal of mixed and undetonated product. Once mixed, it is considered an explosive material so you can not transport it or store it without proper licensing (it must be mixed and shot on site). Not for human consumption. Do not re-package. 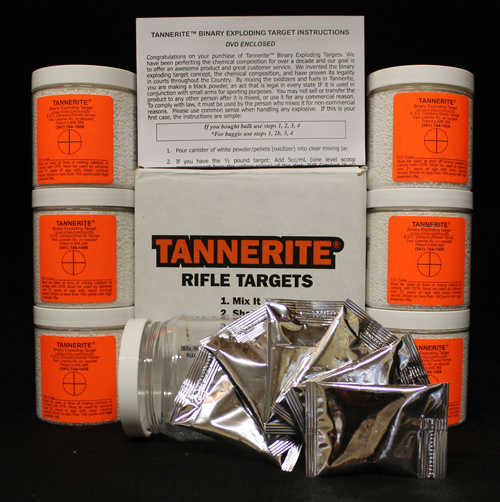 Want to give Tannerite® a try but don't want to buy a big multi pack? Single 1/2 lb target so you can see what the excitement is all about. 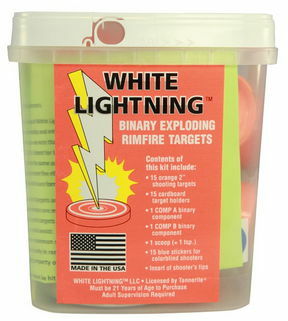 The Tannerite White Lightening Rimfire Exploding Targets are safe and small, yet VERY loud. The White Lightening targets are fun and awesome targets for introducing younger shooters to the sport of shooting. No more mundane punching holes in paper, pick up a pack of exploding targets, and your family will be hooked on shooting. The targets can be detonated at low velocities, so rimfires, handguns, and shotguns are all fair game. Crank up the fun in your next round of backyard sporting clays by mixing in a few White Lightening targets, use them for long range rimfire shooting, the possibilities are endless with these targets. The White Lightening targets do not have the same properties of standard Tannerite rifle targets. If shot in a dry hay field, these could initiate a fire. Although they pass drop-tests and are safe with any normal handling procedures, Tannerite does not want you to mistake them with Tannerite’s incredibly safe properties of the exploding centerfire rifle targets. Although they will not explode from a spark, they can burn at a fast rate if they come in contact with fire, so just follow the precautions stated on the package and enjoy. Warning: READ ALL INSTRUCTIONS AND CAUTIONs BEFORE USING This product must not be mixed away from the location of use and should be detonated soon after mixing. Do not transport mixed product. Do not resell mixed product. Do not store mixed product. Comply with all local, state, and federal rules and regulations regarding use of and/or disposal of mixed and undetonated product. 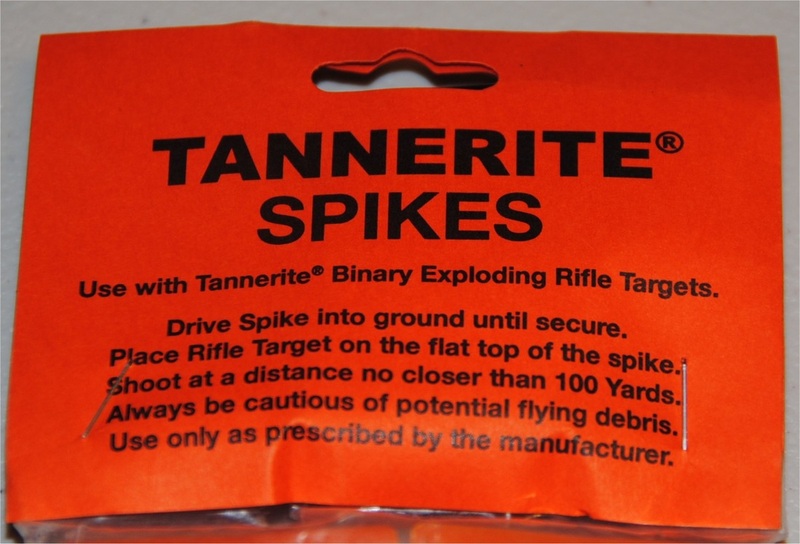 Use these spikes to hold your Tannerite® Targets, 3 spikes per pack.